R.D. Boozer is an astrophysics researcher, member of the Space Development Steering Committee, host of the Astro Maven blog and author of the book "The Plundering of NASA: an Exposé" (lulu.com, 2013). He contributed this article to Space.com's Expert Voices: Op-Ed & Insights. The private spaceflight company Space X plans to build a rocket so big it would "make the Apollo moon rocket look small,"the company's CEO, Elon Musk, announced on "CBS This Morning"on Feb. 3. I would add that the company should also use its rockets and spacecraft to open up orbital space access to friendly governments, companies and individuals who could not afford it otherwise. That would provide a significant stimulus to the U.S. economy. Musk further mentioned SpaceX doing a manned flight around the moon, possibly including a landing. Following those events, he said, SpaceX would use the huge rocket for trips to Mars. NGC 3532 in the constellation Carina, also known as the Firefly Party Cluster. This all begs the question: If SpaceX is going to build this gargantuan rocket on its own dime, anyway, why is the U.S. Congress forcing NASA to develop the less capable Space Launch System (SLS) for many billions of dollars more? Earlier, SpaceX stated it could develop a rocket that would launch 150 metric tons of payload,or 20 metric tons more than the most powerful version of SLS at a fixed price development cost of $2.5 billion (an amount that comes to roughly 1.25 years of SLS's funding). Also worthy of consideration is spacecraft launch company United Launch Alliance's (ULA) proposed — but not currently pursued — economical, large launcher that would loft 140 metric tons at $5.5 billion total development cost. Wouldn't it make more sense for NASA to buy a huge rocket from SpaceX or ULA and get much more capability for less money? If SLS were cancelled now, couldn't a small part of the resulting savings help speed up development of the large SpaceX or ULA launch vehicles — or both? In fact, this was exactly what NASA proposed to Congress before SLS was legally forced on them. Musk's statements also imply that SpaceX must develop an advanced interplanetary spacecraft much more capable than the upsized 1960s-style Orion vessel that NASA has already spent billions on, and on which it is slated to spend billions more. Why not have NASA help SpaceX and other groundbreaking aerospace companies speed things up with a safe spacecraft that is better than Orion, yet less expensive? This craft could be developed via the competitive "fixed-price/pay-only-for-success"format successfully used in NASA's Commercial Cargo and Commercial Crew programs. SLS is so expensive that there is no money left to develop the huge payloads it is designed to carry. Thus, it is often referred to as "The Rocket to Nowhere. "As mentioned in a report from Booz-Allen-Hamilton, this rocket will probably only successfully meet goals for the first 3 to 5 years. Thereafter, the SLS will produce only a very few (if any) exorbitantly expensive flights, after an extravagant amount already spent. If SLS and Orion were scrapped and a fraction of their funds applied to the SpaceX or ULA launchers, NASA could use the resulting savings to produce needed technologies for deep-space exploration. The agency cannot currently develop those technologies because the SLS/Orion costs leave no money for these other projects. Those needed technologies could include radiation protection, artificial-spin gravity, advanced space-propulsion systems and in-space filling stations — all of which are now on the back burner. Additionally, NASA astronauts could perform many more deep-space missions with the alternate launchers. The much smaller unit cost and lower operating expense of these other rockets would permit these more-frequent missions. More ambitious robotic missions would be feasible for the same reason — all within NASA's current budget. Again, NASA proposed this very stratagem before Congress forced SLS on the space agency. 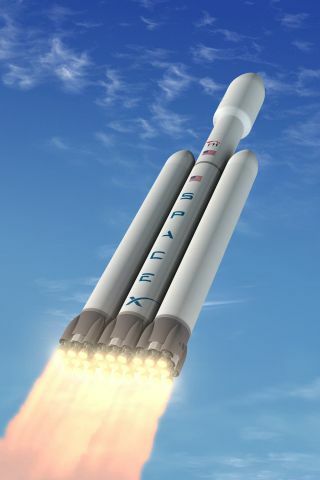 By the end of this year, SpaceX plans to launch its Falcon Heavy (FH) rocket. This craft will have three-quarters of the payload capacity of the low-end version of SLS (not to be launched until 2017 at earliest). FH will have been produced totally without funds from NASA, which appears to be the case with the earlier-discussed Super Rocket, as well. FH is more than powerful enough to send a manned SpaceX Dragonrider spacecraft on the loop around the moon that Musk mentioned. In fact, FH will be the most powerful rocket to fly since the Saturn V moon rocket. And Dragonrider's heat shield is designed to withstand the greatly increased stress that occurs when re-entering Earth's atmosphere from the moon or from interplanetary distances. Two Falcon Heavies (one to launch Dragonrider and a service module, the other to launch a lunar lander) would be quite sufficient for a manned moon landing. Those two scenarios are just conjecture on my part, since SpaceX has not yet announced the details of how they plan to accomplish either of those proposed missions. But they are real and tantalizing possibilities, given the capabilities and relatively low costs of the SpaceX projects. Cover for the paperback edition of "The Plundering of NASA: an Exposé" (lulu.com, 2013). But Congressional politics currently stand in the way of those possibilities. Certain U.S. Senate and House of Representatives pork-barrel politicians garner votes from constituencies in selected parts of the country through the short-sighted use of NASA's budget dollars. SLS and Orion are prime examples of this tendency. Unfortunately, the mainstream media have not yet reported this fact. Even network TV news anchors (some of whom claim to be space enthusiasts) seem unaware of this fleecing of the American taxpayer, which allows foreign competitors like China to gradually erode the huge technological advantage that the United States currently enjoys. Despite all of that, private commercial companies are making innovations that will drastically lower the cost of spaceflight. When faced with this reality, it would seem the ultimate end of SLS/Orion is inevitable within the not-too-distant future. It's time for U.S. citizens to insist that NASA's budget go toward advancing the entire nation's long-term future in space, not just short-term employment for certain areas of the country. By advancing more rapidly into space, the country will create many more American jobs in the future than will come from NASA spinning its wheels with SLS and Orion. The author's most recent Op-Ed was "Allow NASA to Do Great Things Again." The views expressed are those of the author and do not necessarily reflect the views of the publisher. This version of the article was originally published on Space.com.